My heart goes out deeply for those who have experienced such great loss recently. I watch the news and I see the way Americans have been ravaged by tornadoes all over the southern and mid-western United States. Homes destroyed. Lives lost. Wounded hearts. It is crazy to see that so much turmoil can happen, so much damage, from wind. But that’s the amazing thing about it as well. Wind, in its most simple form, is simply a breeze- air. In its most devastating, it is cyclones that can destroy even concrete buildings, bridges, parking garages. It can pick up an entire home as if it weighed nothing. The sound is terrifying. The damage is beyond anything imaginable. But eventually the storm ends. The clouds part and the sun comes back out. The damage is left behind. The memory of that storm will be carried by the survivors the rest of their lives. Their loss as well. But looking at pictures and watching videos of these recent storms, I am reminded of something else. Hope. Storms will come, but hope is ours for the taking. When everything is lost. When everything is gone. There can be hope if you seize it. 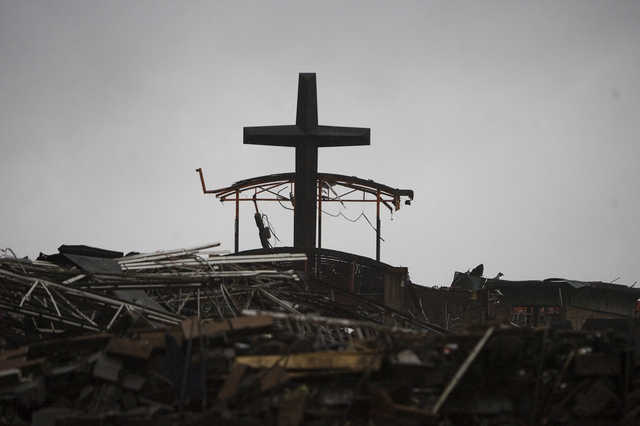 This cross is what was left standing after the church and everything around it was flattened by the F4 multi-velocity tornado. Those in Joplin, MO saw this and in a brief moment of their pain, they had a glimpse of hope and a future. Jesus Christ was with them. Though lives were lost and many still missing, those that survived have the choice to trust God in spite of what has happened. They can take hold of this hope. The hope that saved their lives. The hope that will get them through this devastation. There is hope. Always.